No 4th of July celebration would be complete without a barbeque. Yet, organizing one can be a giant headache. Here is how Laserfiche can take a lot of the hard work off your plate—and leave more room for potato salad! You can’t have a barbeque without grilled meat. But not ordering enough can leave your guests disgruntled, while ordering too much can lead to microwaved burgers for the rest of the week. With Laserfiche Forms, you can have users specify their meat-eating preferences and quickly tally those up before you go to the supermarket. That way, you know exactly how many chicken legs (or veggie burgers) you need to buy. If you’re providing the main course, it would be nice if the guest provided the side dishes, salads, appetizers and desserts. 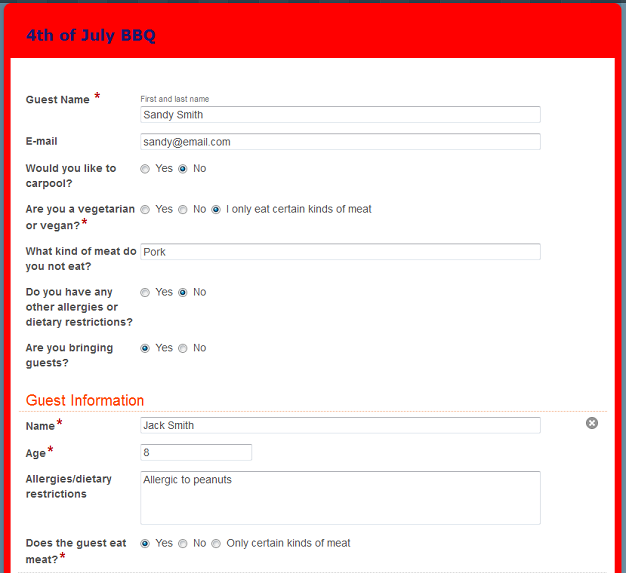 Laserfiche Forms allows guests to specify a dish to bring. Guests can see what others are bringing by looking at a PDF document with a list of dishes linked directly from the Laserfiche Form. This way, you don’t end up with three versions of potato salad and no dessert. This document is updated automatically by Laserfiche Workflow as soon as a new form is submitted. A 4th of July barbeque wouldn’t be complete without a lot of merrymaking. Make sure that no one drives home under the influence by using Laserfiche Forms to arrange carpools and designate sober drivers. 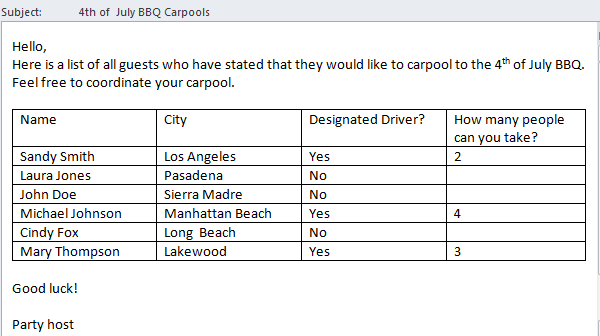 Guests specify carpool preferences in Laserfiche Forms, and Laserfiche Workflow then emails a list of designated drivers to everyone who wants to carpool. Guests can then arrange their own transportation. A 4th of July celebration wouldn’t be complete without fireworks and games. 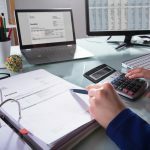 Laserfiche Forms allows guests to specify if they plan on bringing fireworks or some other form of entertainment, such as an outdoor movie projector or badminton set. Now that Laserfiche has automated your 4th of July barbeque, you can simply relax and enjoy the fireworks. Your 4th of July BBQ isn’t the only process you can automate. Discover how you can automate almost any process by getting your free copy of the “How to Diagram Your Business Process” eBook.